This scenic tour from Portland takes you into Oregon’s stunning wilderness to view Multnomah Falls and the Columbia River Gorge. 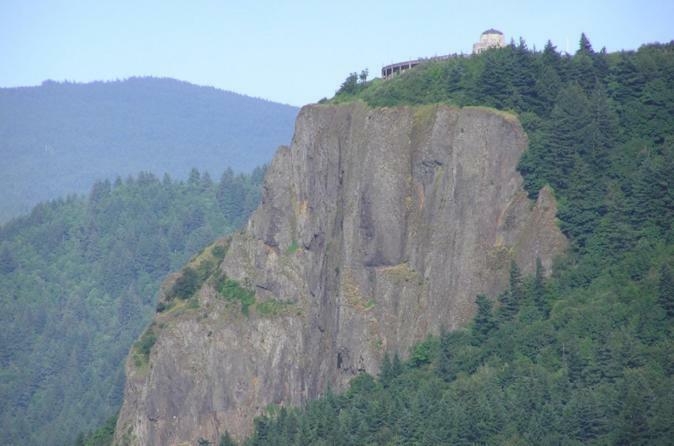 Enjoy panoramic views from Crown Point and Visit House on the Columbia River Gorge Highway before descending down to Latourell Falls, dramatic Multnomah Falls and Bonneville Dam. Learn about the area from your guide and follow the route of the Lewis and Clark Expedition on the way back to Portland. This 4.5-hour tour showcases the beauty of the Columbia River Gorge National Scenic Area and the incredible diversity of scenery at Portland’s doorstep! Your tour departs from Pioneer Square in downtown Portland in the morning. Hop aboard an air-conditioned coach and get ready for a beautiful 1-hour drive east to the Columbia River Gorge, which carves a spectacular corridor through the Cascade Mountains in Oregon and Washington. This vast canyon and its surroundings are designated as a National Scenic Area to protect the natural, cultural and recreational resources of the Columbia River Gorge. This area is home to a spectacular combination of landscapes, rare plants, wildlife, farmland, ancient Indian rock art and other sites, many of which you’ll discover on your tour. Traveling along the historic Columbia River Gorge Highway, enjoy your guide’s informative narration as you admire sweeping views from hundreds of feet above the Columbia River, stopping for photo opportunities at Crown Point and Vista House. Then descend along the highway loops on your way to pristine Latourell Falls, where you’ll stop for 20 minutes to view the falls. Continue past Wahkeena Falls to Oregon’s most famous natural attraction, Multnomah Falls. This dramatic waterfall is the tallest in Oregon and the second-tallest in the US! Stop here for 25 minutes to admire the dramatic, multi-tiered waterfall that is famous for its views, walkways and Great Depression-era lodge. Next, view the Oneonta Gorge and Horsetail Falls on your way to Bonneville Dam, a national historic site in the heart of the gorge. During your 30-minute stop here, learn about the amazing engineering feat of the damn and fish ladder at the visitor’s center and admire the dam from the outdoor viewing area. Return to Portland along the river-level route of the Lewis and Clark Expedition. Enjoy the unfolding panorama including Beacon Rock, Cape Horn and Rooster Rock, all sights first noted by the famous explorers over 200 years ago. You’ll arrive back in Portland in the afternoon.